This was another fast, fun read by Sally Mackenzie. I have not reviewed the first book of the series because I felt I didn't have much to say about it, but this one generated a need in me to write down my likes... and dislikes. After reading THE DIVINERS, desperately needed a light book that I didn't have much expectations about, because I knew scarcely nothing could compete with Mrs. Bray in writing until I had some time to get over the shock of her amazing style, so I decided to pick up the Naked Nobility Series, a group of books sure to be fun, light and fast - and that's exactly what I got. 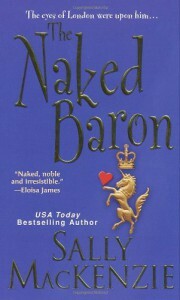 I finished THE NAKED DUKE (Naked Nobility #1) and THE NAKED BARON back to back in one sitting, thought this review would only refer to the latter. The first, Lady Grace and Baron David Dawson. The second, Grace's aunt Kate and David's uncle Alex. I thought it was interesting to read two different stories about different age groups in the same book, intertwining together.